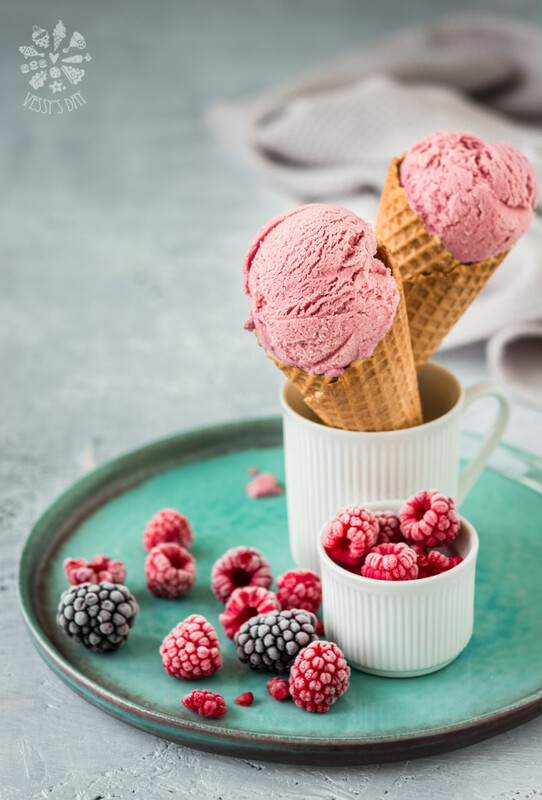 This beautiful ice cream is made of fresh raspberries, blackberries and classic yolk & cream base. 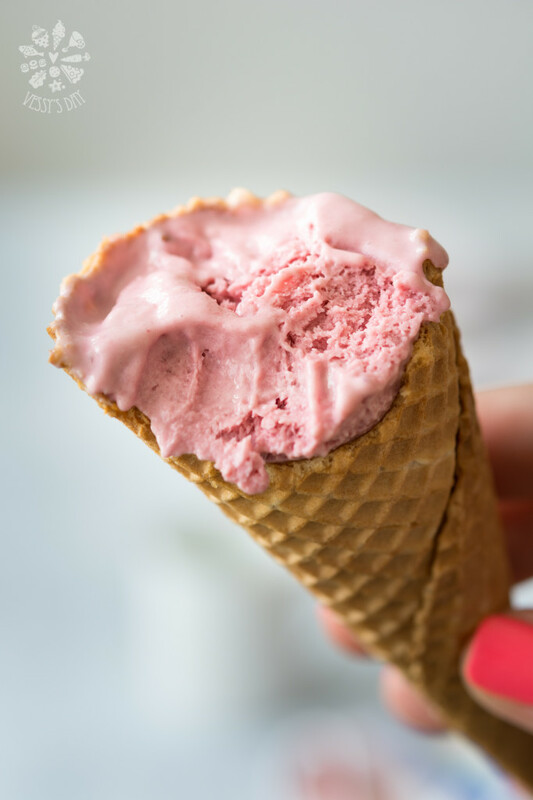 As you’ve probably noticed in my older ice-cream recipes, I don’t use an ice-cream maker for any of my ice-cream recipes, not that I don’t want to, I just don’t own one. 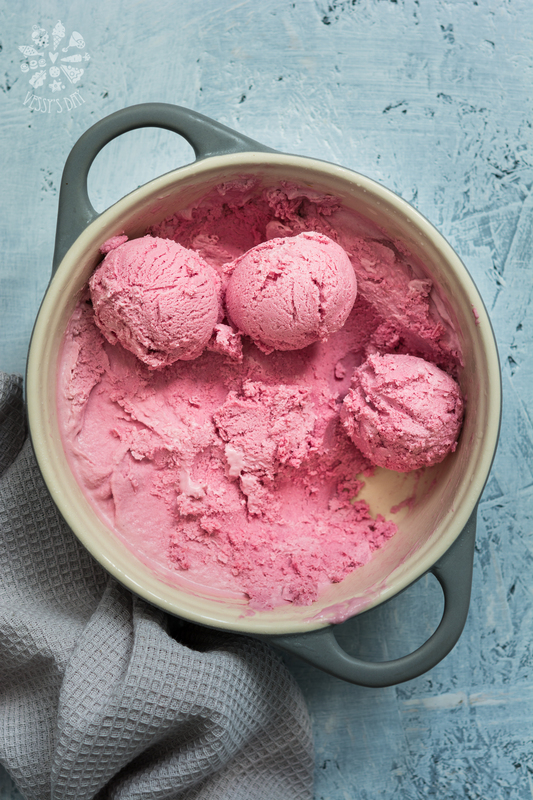 This recipe, as any other of my recipes, is also perfectly doable without an ice-cream machine. There a few tricks you can use if you want to make a good ice-cream without churning it. One of those tricks is adding a few tablespoons of alcohol, which will keep the ice-cream from freezing too hard. This is a great option if your ice-cream will be consumed only by adults, but if you have hungry kids at home, it’s probably not the best idea. 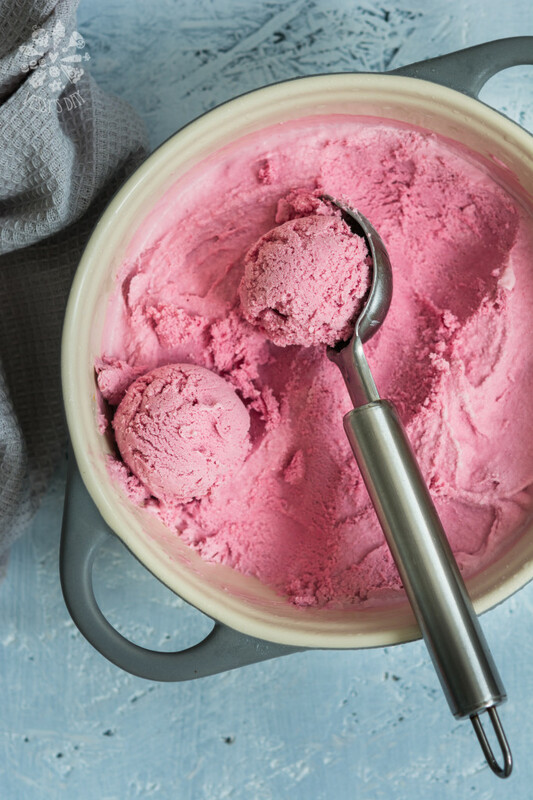 Often when I’m in a hurry I just mix all ingredients and put the ice-cream straight to the freezer, but this way it often freezes hard, so I have to take it out of the freezer at least 30 minutes prior serving. The other option which I used in this particular recipe, which requires kind of more attention is to “freeze & beat” a few times until ready for deeper freezing. This is actually what ice-cream makers are for, but instead you are doing the churning yourself. So, what I do is prepare the ice-cream and put it in the freezer for about an hour (or more if I forget, but not more than 2 hours or it will be to hard to beat), then take it out from the freezer and beat it with an electric mixer for a few minutes in order to incorporate air into the mixture. Then I put it back into the freezer for another hour and repeat the “freeze & beat” steps a few times. This is actually a lot easier than it sounds, mostly because in between beating the ice-cream you can actually do whatever you have to do around the house, only requirement is to be at home, thou. 2-3 times of beating while freezing are enough. If you ask me if I find any difference between not beaten and beaten ice-cream, I have to say I do. There is difference in the texture. 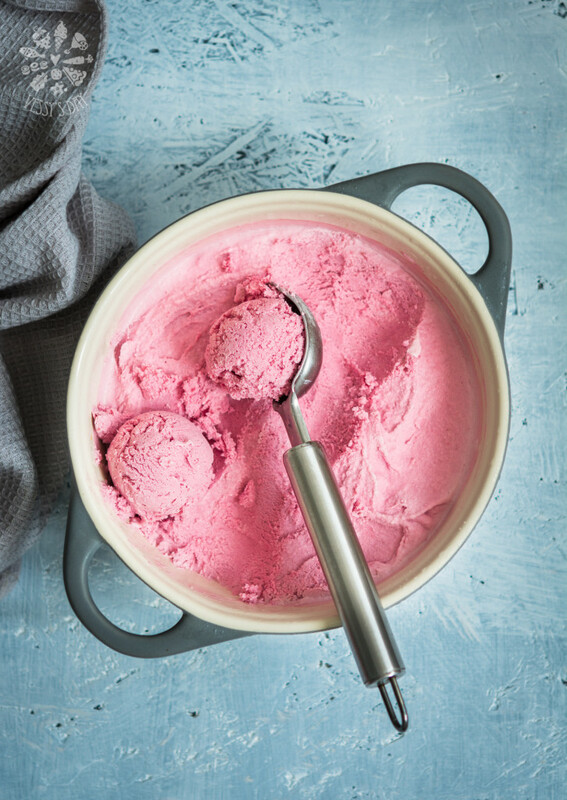 Beaten ice-cream is much smoother and softer and the reason is the air that has been incorporated. 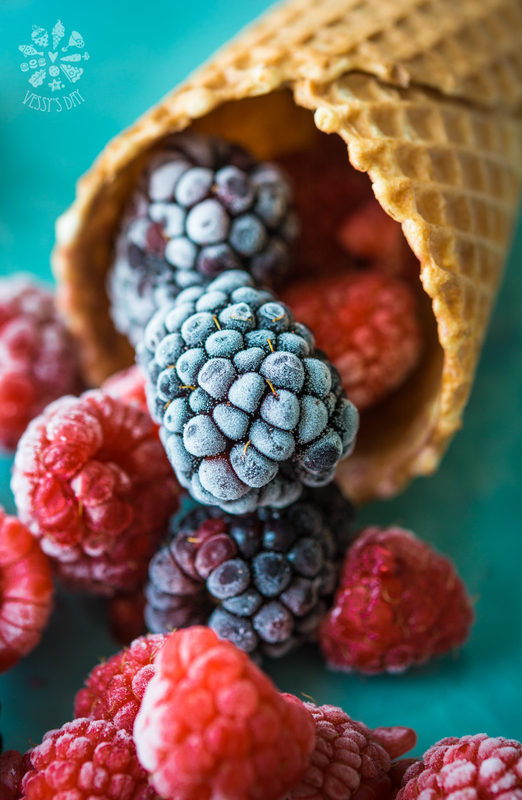 But even if you don’t have the time to wait and beat the ice-cream it’s OK, just keep in mind to remove it from the freezer at least 20-30 minutes before serving. In a large bowl beat egg yolks and sugar until light yellow. Set aside. Heat the milk in a small casserole over medium high heat, but don’t let it boil. Once milk is hot enough, but below boiling point, remove from the heat and start adding it to the egg yolks, slowly while beating the yolks at the same time. Do this very slowly in order to temper the eggs and avoid curdling them. Transfer milk/yolk mixture back to the casserole and heat over medium heat, while beating constantly. Cook mixture over medium heat (even medium-low) until mixture thickens. Don’t let the mixture boil. Heat mixture until it’s hot to the touch but below boiling point. If you have to, just start with low heat then gradually increase the temperature. Once mixture has thickened transfer it to a clean bowl and add the cream. Stir to combine and set aside to cool completely. **** Thickening takes about 3 to 5 minutes, and keep in mind that mixture will still seem a bit liquid. It won’t thicken too much, don’t expect to turn into a thick pudding consistency. You will know mixture is ready when coats the back of a spoon. If you run your finger through the middle of the back of the spoon it should leave a clear path. In the meantime puree blackberries and raspberries then strain through a fine mesh and discard the seeds. 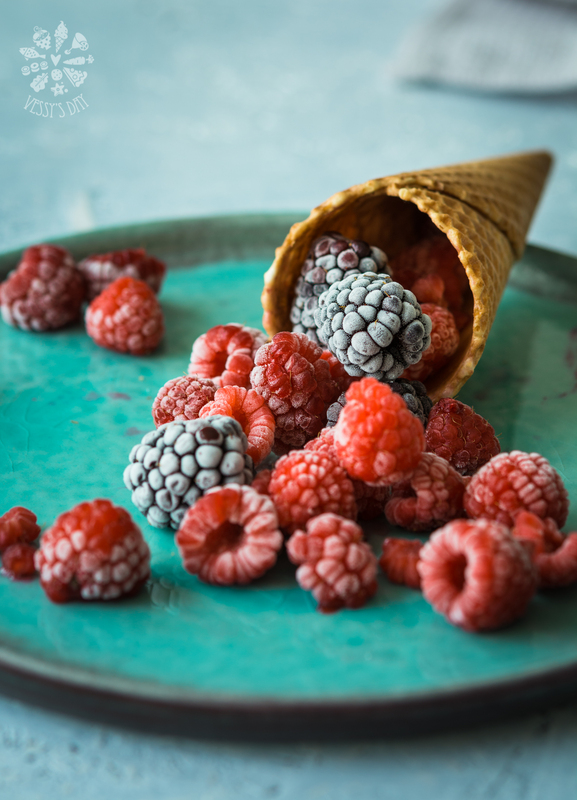 Add raspberry/blackberry mixture to the ice-cream base and stir to combine. Transfer to a freezer proof container and freeze until ready.